This video guide is divided into six sections and traces the Aztec Empire from its origins, to its rise as the leading power in the early Americas,until its fall to the Spanish conquistador Hernan Cortez in 1521. There are a total of 28 narrative questions with fill in the blank answers that span the 45 minute video. This guide is divided into five sections and examines the mysterious and amazing Maya Empire's growth into one of the greatest and most advanced of the world's early civilizations. There are a total of 21 narrative questions with fill in the blank answers that span the 45 minute video. 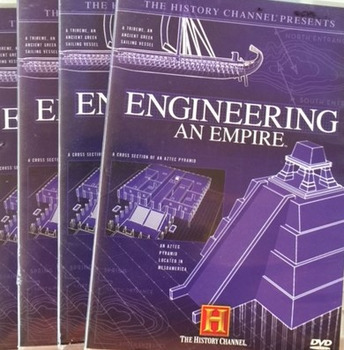 These Engineering an Empire Video Guides are also available as part of our substantially discounted 14-Episode Complete Series- Engineering an Empire Video Guides with Teacher Keys. Save over 20% on individual video guides by ordering this bundle now. ***Please see our related products in our "History on Demand" store. There are an array of PowerPoint Presentations, guided outlines, and other activities that work extremely well with the Engineering an Empire videos to form an entire teaching unit. *Individual Engineering an Empire video guides for China, Persians, Carthage, Greece, Age of Alexander, Rome, Russia, Byzantine Empire, Britain, France. *Discounted bundles of all above PowerPoints and Outlines.